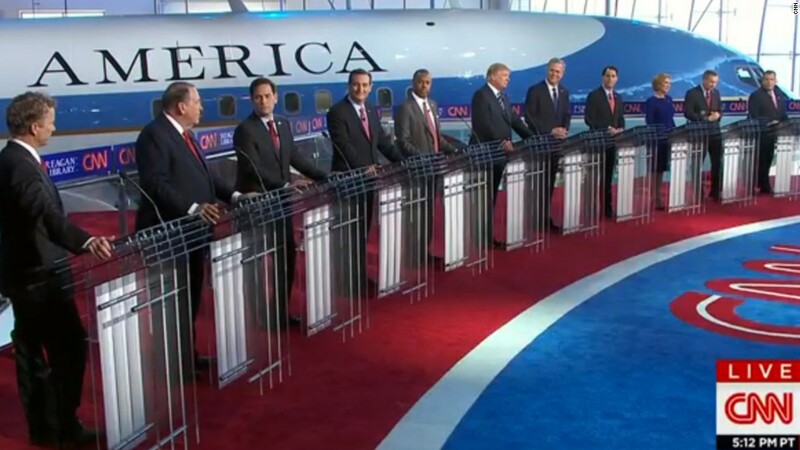 A live stream of CNN's Republican primary debates attracted a record crowd on Wednesday night. The stream was front and center on the CNN home page during the debates. As of 9:45 p.m. ET, about an hour and a half into the prime time debate, the live web stream had 921,000 concurrent (or simultaneous) viewers, according to Alex Wellen, the company's chief product officer. Wellen called the traffic "massive" -- by far the biggest audience a primary debate has had on the Internet. The number of "peak" concurrent viewers was unknown. The Super Bowl earlier this year had a concurrent audience of 1.3 million web viewers at its peak toward the end of the game. Although the streaming audience was sizable, the vast majority of viewers watched via cable TV. Past events have shown that people watch on big screens when they can; web streams on phones and tablets are usually a backup option. The TV ratings for Wednesday's twin debates will come in on Thursday. If it lives up to expectations, the prime time debate will be the highest-rated program in the history of CNN, surpassing the prior record of 16.8 million viewers set back in 1993. The prime time portion of Fox's debate last month had 25.1 million total viewers. Viewers who want to watch CNN on the Internet usually have to log in with cable or a satellite provider password, since CNN is part of the bundles of channels cable subscribers pay for. "Given the massive public interest and value of this event, and the launch of CNNgo 2.0 across all platforms, the timing was ripe to roll out this live TV preview to all of our audiences," Wellen said in an email. CNNgo is the Internet streaming version of CNN. Wellen said the goal was "to reintroduce tens of millions of CNN consumers -- including our pay TV subscribers -- to a service that now has 100 hours of on-demand TV programming, deep personalization, and a revolutionary real-time live TV experience." While CNN has been live streaming events for many years, Wellen said Wednesday's debates required more preparation than any of them, because of the expected surge of traffic. In addition to being a promotional opportunity, the live-stream also answered critics who said Fox News should have live streamed its August 6 GOP debate for free. Fox only made its live debate available on the web to authenticated cable subscribers. When a YouTube channel from Sky News, part of the same parent company as Fox News, was found to be live streaming the debate for free, Fox shut it down mid-debate. Cable news channels have been hosting debates for decades, and limiting live access to those viewers who pay for cable (as most households do). The debates are costly to produce and televise. But the rise of online streaming and cord-cutting households has given rise to complaints about the restrictions. Susan Crawford, one of the most prominent critics of the cable business, wrote in a blog post after the Fox debates that "there are all kinds of public values at stake here, and we shouldn't glide past them. ... There is no speech more central to civic life than a political debate. And yet we have allowed access to that speech by way of the common medium of our era -- high-speed Internet access -- to be controlled by a cabal of private actors." When it comes to the Internet streaming of debates, there is also a more practical concern: overloaded servers. Some of the cable subscribers who tried to watch Fox's live-stream on August 6 said it crashed; a Fox spokeswoman blamed "unprecedented, overwhelming demand." On Wednesday night there were sporadic complaints on Twitter about the quality of the live stream, but for the most part, the servers seemed to hold up well. In many cases, users said, it was just like watching TV the traditional way.